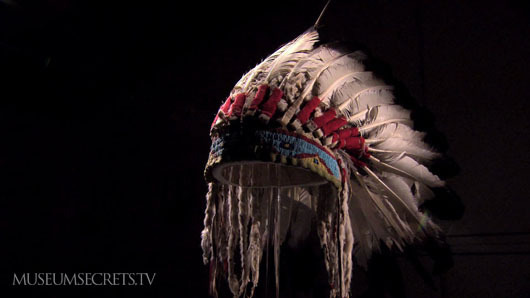 Museum Secrets : Sitting Bull’s Headdress? Is this Sitting Bull’s Headdress? Can his great-grandson tell us? Through inspection of form, materials and markings, curator Arnie Brownstone has identified this artifact as a Sioux headdress from the late 19th Century. That makes it rare and valuable. It may be rarer still. Arnie has reason to believe it once belonged to the great chief Sitting Bull. But he doesn’t know for sure. 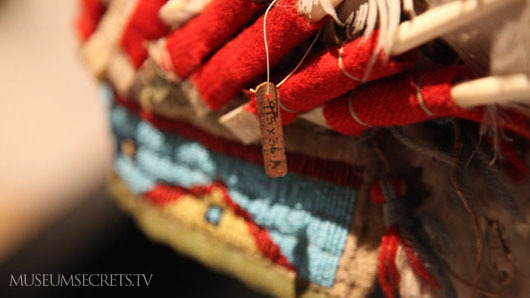 Museum artifacts that lack clear provenance are given ID numbers prefixed with the letter X. The headdress is such an "X File." Curator Brownstone has tried every scientific method at his disposal but cannot prove if it was owned by Sitting Bull or not. Where can one turn when rational avenues are exhausted? Museum Secrets decided to consult someone with a personal connection to Sitting Bull: his great-grandson Ernie La Pointe. Ernie believes he can discover the answer by consulting the realm of the spirits. Can he really tell us if the headdress belonged to Sitting Bull? 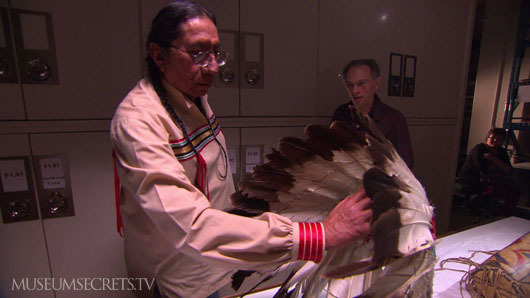 Decide for yourself by watching Museum Secrets: Inside The Royal Ontario Museum. When Sitting Bull’s great-grandson visited the ROM to view the headdress, he moved his hands over it to try to feel what he called its "energy." Want to know what happened before, during and after the Battle of Little Bighorn from Sitting Bull's point of view? His great-grandson tells us in this Web Exclusive Video: Battle Revisited. It's no secret that Sitting Bull and his tribe were forced to flee north after the Battle of Little Big Horn - a battle that was portrayed by the US media as an Indian massacre. And most Canadians will know that once Sitting Bull reached Canada he enjoyed the sympathy of an RCMP officer named James Walsh. Though the native headdress in the ROM is without provenance, many historical accounts agree that before Sitting Bull returned to the USA, he gave his headdress to Walsh as a parting gift. 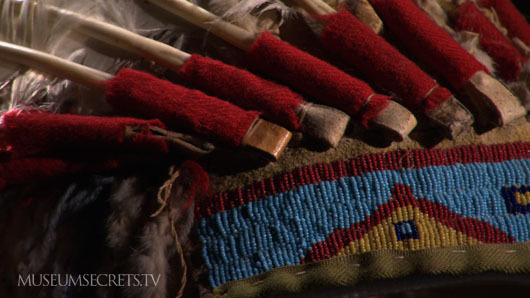 Sitting Bull's great-grandson tells us why in this Web Exclusive Video: Gifted Headdress. As a boy, Sitting Bull was called "hunkishne" which means "slow." How did such a child grow up to become a great chief? His great-grandson reveals the answer in this Web Exclusive Video: Boy Named Slow. looking for information of the five robs that deplict custers battle ordered to be assembled after the battle of little big horn by sitting bull.